In our wonderful world there is a chemical reaction that occurs in people when one or more of their senses interacts with the others. These senses of sight, touch, hearing, smelling, tasting or imagination (6th sense?) somehow inspire beautiful songs to be writ-ten. If the chemical reaction causes an attraction of one person to another it is called ‘LOVE’. If the reaction occurs in two people simultaneously then is it considered ‘LUCKY’? 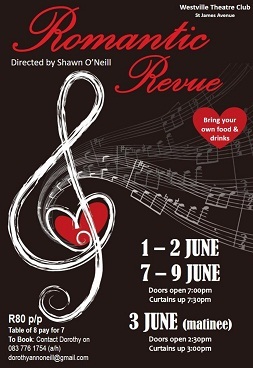 So say the organisers of Romantic Revue, a forthcoming production directed by Shawn O’Neill from the Westville Theatre Club. Romantic Revue is a compilation of favourite romantic songs performed by a talented cast of singers and dancers, accompanied by a live band. The songs depict the various emotions associated with this primitive form of chemical warfare, spelled L.O.V.E. “Join us for a light-hearted, fun evening and relive Valentine’s Day. Bring a picnic basket filled with your favourite chemicals and a red rose. Who knows what might happen,” says O'Neill. Romantic Revue has performances from June 1 to 3 and again from June 7 to 9, 2018. Shows at 19h30 except for June 3 which is a matinee at 15h00. Doors open half an hour beforehand. The Westville Theatre Club is in St James Avenue in Westville.